We live in an interesting time, but not in a unique period. We are in the midst of reliving our grandparents' and great-grandparents' reality. Their reality was dealing with the shift from an agrarian society; ours is taking the manufacturing economy they bestowed upon us and working our way through the earliest days of the technology age. Both transitions have been driven by advancements in communication, transportation, medicine, and uncountable technological “miracles.” Each had the capability (one proven and one we are working through) to extend and benefit the quality of life on a global basis. And both needed to deal with a significant disruption in the job market. How people worked, where people worked, what they did for a living, and the skills they needed all changed. We have a problem today with the ability of a sizeable portion of our population making sufficient income to support themselves and their families. Raising the minimum wage is a simplistic and politically packaged proposition, but it is certainly not a sustainable solution.It won’t create a living wage and, instead, will ensure generational poverty. We impose tariffs on goods and tax products and services to reduce their consumption; the Fight for $15 is simply a tariff on labor and job creation. Its debate squeezes out our examination of the root causes that trap people in minimum-wage jobs and how to find sustainable solutions. It is imperative that we do so. FDR and LBJ took us in a fight against poverty, but unfortunately many of the progressive plans that were spawned caused decades of poverty and other social problems. What we know from the last major economic shift is that the issue cannot be neatly placed in a separate silo, since everything in our economy is interrelated at some molecular level. We have come to understand that some government involvement can be beneficial, but that government micro-management has never proven to be positive or efficient in solving most long-term economic problems. It is really not in their wheelhouse, since elected officials and government bureaucrats generally have too many conflicting constituents and lack the personal business knowledge required to get too far into the weeds. When I think of government micromanagement, I think of politicians dredging a lake as they look for new beneficial regulations to help us. The problem is that as they create these new regulations the water often gets too deep, and we and our economy begin to drown. To a great extent, “beneficial” regulations are a major cause for many of the problems we face in working through this current labor transition. History can be a funny thing. What we think is fact is often mythology tainted by the teller’s belief system. As the myth is repeated and unchallenged with the passage of time, it becomes fact. FDR was an immensely popular President and still is, despite the fact that while the pre-war jobs programs he instituted were popular and beneficial in the short term, they actually masked many of the economic problems of the day and extended the Great Depression. He was a populist, but he understood that to win WWII he needed to turn war production, without government interference, over to private company executives in order to meet the needs of our fighting forces. Much can be said along the same vein with LBJ and his war on poverty; we are still reeling economically today from some of the seeds he planted. We are again treading water and gasping for air between waves of regulations that the government is enacting for our benefit. I know they are trying to protect us from the normal and natural job disturbances that are happening during the current economic transition, but it's not working. David Weil, the Administrator of the Wage and Hour Division of the Department of Labor’s book The Fissured Workplace, is not responsible for where we are today - but it has become a sort of blueprint for where we are heading. His book is a well-written, simplistic, and impractical set of illogical populist views designed to preserve and impose a post-World War II labor model on a 21st century economy. It masks the underlying issues inherent in our economic shift and, were it written in the early 1900s, he would likely be blaming Henry Ford for making the job of the blacksmith less relevant and needed, just as he is blaming franchising and Uber for changing the dynamics of how we work today. Our society and our capitalist structure of commerce are merely designed to achieve the creation of opportunities. No economic system can really determine outcomes, which we see from the pitiful economic growth in the over-regulated EU and, historically, a bit farther to their east. At the turn of the last century, because of technology, communications and our manufacturing capabilities, fewer workers were required to feed a growing nation and world. Yet we morphed into the leading country in the world with the highest sustained standard of living, and the supply of food dramatically increased. Dr. Weil misses the fact that in today’s shift, how people work and how they choose to make their livings is different from the 19th and 20th centuries. Businesses simply no longer need to engage the type of labor with the structures we used back then. Labor was transformed in the 20th Century, and workers needed to learn a different set of skillsfor that new economy. The process may have been ugly at times, and it did not happen overnight, but it worked because market forces were allowed to transition the economy without truly significant government impedance. Unions were a benefit in the 20th century, but lost their way as we entered the 21st. Andy Stern, past president of the SEIU, recently said “I believe that this is not our father's or our grandfather's economy, that the 21st century will not be employer-managed. It's going to be self-managed, because the growth in alternative work relationships - contingent, freelance, gig, whatever you want to call it - is clearly going to increase. Although the economy can grow in terms of GDP and productivity, it no longer means there will be wage growth or job growth, as opposed to the 20th century." Many of the legislation and rules enacted in the 20th Century actually assisted the beneficial changeover. Impeding changes necessary for this 21st Century economy, as David Weil wishes to do, may seem popular in some quarters, especially with current union management and low-wage workers, but just as FDR’s policies in hindsight were popular at the time, they did not focus on the root cases of the problems and the Great Depression lasted longer than it should have. It was the labor necessities of the war years, and the pent-up demand that followed, that brought us out of the Depression Era - although no one can argue that there were essential and immediate benefits to the workers who found interim jobs because of the programs FDR enacted. Government actions can be beneficial when they are targeted and limited. In his first inaugural, Ronald Reagan stated: “We have been tempted to believe that society has become too complex to be managed by self-rule.” In advancing Dr. Weil’s lament over progress, we are freezing the current generation’s opportunities and future to preserve a dying labor model, as Reagan warned. Weil’s solutions may have had a place 100 years ago when labor unions were a necessary part of the solution, but we are living in a different economic period. Unions are fighting to preserve an old model of labor and are no longer a material part of the solution; Dr. Weil’s philosophy in protecting them is retrograde in a technology economy, and is out of place and highly inappropriate. We live in a fissured economy because, in the age of technology, a fissured workforce is appropriate. There is less need for labor as it was once defined; the new worker requires different skills; and,there is a desire to work differently than workers of the past. Technology has reduced the need for the low-skilled workers Dr. Weil is looking to protect. We will soon be using biometrics to shorten TSA lines at airports, thus improving security but at the same time eliminating the need for some TSA staff. There are fewer airline staff at airports checking us in for our flights, and the same biometrics, when used by the airlines, will reduce that number even further while also speeding up onboarding procedures at the gate. Quick-service and fast-casual restaurants are adopting tablet ordering, payment applications, and even robots that millennials love to use, and therefore require fewer counter, back of the house and wait, staff. This does not even factor in the use of machines and robots to replace jobs that were once thought necessary. Nurses and home health care workers are being replaced to an ever-growing extent by telemedicine practices long in use in Africa and at the Base of the Pyramid to deal with a shortage of trained medical personnel. Even hotels are transitioning and offering discounts to travelers who do not want their rooms serviced on a daily basis. It’s also been a long time since I actually needed to check in at a hotel’s front desk, ever since an app enabled me to do so online. The menial, less-skill-oriented jobs previously available to under-educated and low-wage workers are declining at a rapid pace. The exact same thing occurred during the last economic transition. Rather than understanding the root causes of the transformation and instead of looking at ways the government can play a positive role in nudging us into the future, Dr. Weil simply laments the necessary changes in how labor is being used.We are at a tipping point of generational poverty if we continue down Dr. Weil’s path. I recognize that Dr. Weil may not be the best-known regulatory name in franchising, since much of the focus has been on the activities of the NLRB and its General Counsel Richard Griffin. That is unfortunate, as Dr. Weil’s philosophy is actually driving much of the debate. Griffin’s role in the advancement of unions is proper, given the charter and make up of the NLRB board, and understandable given his working background with unions. Even though I most certainly disagree with the views of the NLRB board in changing the definition of joint-employment from direct control to indirect and potential control, I am less alarmed by the actions of the NLRB than those of Dr. Weil and the Department of Labor. An argument can be made, and I have certainly made it myself, that our required focus on joint employment may actually prove to be somewhat beneficial to franchising. It has triggered a renewed look at the issue of a franchisor setting and enforcing standards. In the process it is pushing the pendulum back a bit on control and day-to-day management in some companies that may have gone a bit out of balance, and that could have resulted in concerns over vicarious liability. If only we had a better and more clearly crafted NLRB definition of joint-employment as the NLRB wishes to advance, I have no doubt that franchising would be able to cope and evolve. We went through a very similar discussion in franchising in the 60s and 70s when franchise disclosure was first introduced. The difference was that we had legislative clarity over the rules from the outset, and over time those rules have even become better defined. We benefited in many ways from the regimen of disclosure, and a focus on joint employment could also be beneficial. The problem we face, though, is that the current Joint Employer definition is murky; even the NLRB’s senior lawyer can’t clearly define what the NLRB board really means. This lack of definitional clarity is unnecessary, unfair, and could have been avoided had the issue first gone through a legislative filter. The NLRB board should never have enacted the magnitude of change that was espoused administratively. Browning-Ferris will likely continue to dominate discussions on franchising. Although the case had nothing to do directly with franchising, it has affected the way franchisors and franchisees interact. I support the IFA’s efforts to overturn the NLRB’s new definition, and its efforts to have states enact legislation that properly defines an independent contractor relationship. On a practical note, the actual impact that the Browning Ferris decision will have on franchising is not immediately known. It is the rare franchisor that would even consider the contractual restrictions Browning Ferris imposed on its independent contractor. Still, as a standard, the NLRB’s joint-employment definition will be manipulatively exploited and used to advance seemingly unrelated matters; we see this today in the actions of the unions, and in cities and states trying to enact discriminatory minimum wage policies. Where do unions fit into pushing many of these changes? Unions are today a very serious part of the problem and are not part of the solution, as Andy Stern suggests in his Atlantic interview. Unions are providing the human and financial resources necessary to drive the Fight for $15 discussion and are doing so in an attempt to survive, since private sector unions are failing due primarily to our transition to a technology economy. Without public sector unions, the union movement would have died in the United States by now, as the private sector union movement accounts for only around 6% of the private sector workforce today. The lack of beneficial services to its members, and their dissatisfaction with union management, is fueling its decline. Union management believes that their survival rests on the feeding tubes provided by the regulatory support made possible through their political donations. However, even with aggressive support to give unions greater power to recruit new members, those efforts are having limited impact as their membership continues to decline. Recently, SEIU and the American Federation of State, County and Municipal Employees announced steps toward merging to offset the decline. Like a shark on the deck of a boat, unions retain a significant amount of power to lash out and are no less dangerous even as they gasp their last breath. 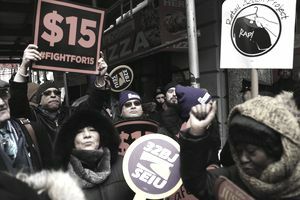 Much, if not all, of union efforts today are driven by their attempt to survive: joint-employment; minimum wage; the fight against the right-to-work movement; and the fight to prevent workers from having the choice of whether or not to join a union. It won’t work as unions are currently configured, because where workers have been given the choice, a significant number are choosing to cut their ties with both the public and private sector unions they were once forced to join. The activities of Dr. Weil, the NLRB, the unions, and the Fight for $15 have brought us to a tipping point that will result in generational poverty. It is a fact that there is a declining need for unskilled entry-level workers today. The rush to impose higher labor costs on companies that employ the bulk of these workers is illogical. It will in fact have the unintended consequence of accelerating the switch to automated technology by employers, as they turn to technology to perform tasks currently done by unskilled workers. The minimum wage was a band-aid designed for a different time and for a different purpose. Advancing the notion that it should be a “living wage” is destructive and demeaning, and also crowds out beneficial discussions we should be advancing as we look for solutions – some, where government involvement might prove beneficial. Private-sector job creators have an obligation to their investors to limit the risk to their capital and to earn a return on their investment. Imposing a material increase in the minimum wage will only cost jobs and limit economic growth. My home state of Connecticut is a good example. It is as blue a state as there can be; California is purple in comparison. We are over-taxed, over-regulated, and have been legislatively micromanaged into a ditch. GE and the insurance industry are relocating; the only manufacturers left are defense contractors. We are near the bottom in the nation in private-sector job creation and economic investment. Connecticut attempted to fix its budget this past year by taxing employers $1.00 per employee hour if they did not pay a super-premium minimum wage of $15.00, despite the fact that the current minimum wage is $9.60. Legislation was also proposed to mandate a minimum work week in some industries. Both failed to pass. The new tax on job creators was going to offset the increased social services budget due to unemployment and underemployment. The state itself was exempted from paying the higher wage, under the theory that it would hire some of the private-sector workers who lost their jobs in order to better provide social services to the folks who lost their jobs due to the new tax. Even in California that logic would make Nancy Pelosi blush. Connecticut has become the most creative anti-business State in the nation. I serve on the Low Wage Board in the State of Connecticut. The legislature stacked the board to ensure that a recommendation to increase the minimum wage in the state could be assured. The members are all fine professionals, with the majority of the board made up of union members, government workers, lawyers, and others whose work backgrounds and beliefs naturally will support a minimum wage increase. Until recently when we added two more business executives, I was the sole business representative on the board. I expect that in December a majority of the board will support an increase in the minimum wage - a legislatively predestined outcome. In Connecticut the minimum wage was raised to $9.60 per hour in 2015; the result was limited economic growth, the loss of jobs, and an increase in deficits. Rather than reduce the number of people who needed social services, the state actually needed to budget more, because the pool of individuals who need government assistance increased. It is tragic to sit and listen to hard-working individuals who are caught in low-wage positions and not feel empathy. But increasing the minimum wage will not provide them with sustainable relief, will cost them opportunities, and merely allows the state to avoid the hard task of looking for solutions. My hope is that the Low Wage Board, after it finishes with its reflexive opinion to increase the minimum wage, will pivot and look at long-term and effective solutions. Ironically, the only industry that has possibly benefited from the increase in minimum wage and all of the state’s other anti-business talk and initiatives are the companies taking headquarter companies like GE and well-to-do residents to other states. New job creation in Connecticut is near the lowest in the nation today. Pay to any worker must be commensurate with the rate of return an employer can obtain through that worker’s efforts. If we raise the minimum wage, fewer jobs will be created for the younger unskilled workers, as business will instead focus on hiring from the older and more experienced unemployed work force. There will be no low rung on the ladder for the younger workers to begin their career climb. We need to invest in helping people move up, and then continue to help them achieve prosperous careers. Doing so is harder than selling low-wage workers on the myth that penalizing the creators of work will benefit them or their families. Instead of creating a generation of unemployed, we need to start dealing with the underlying problems now - because if we don't, the best we can hope for are higher wages for some and a higher level of permanent unemployment, underemployment, and generational poverty for the rest. I find it ironic that franchising has been targeted for discriminatory minimum wage hikes. I understand why it is happening; unions see organizing workers at independently-owned franchised businesses as possibly their last hope of survival. What is truly sad is that franchising is the largest trainer for entry-level and low-wage workers in the skills they need to advance in their careers and that will be necessary for them to earn a living wage. Unfortunately, rather than being celebrated as one of the last bastions of the economy that still employs minimum-wage workers, franchising is under attack precisely because they do so. Many of the minimum-wage workers who come to the hearings in Connecticut are minorities who work in restaurants, hotels, and as home health care providers. Those jobs are starting to slowly disappear. It makes me angry to listen to the backers of the Fight for $15 when they try to advance the myth that a minimum wage can ever be a “living wage.” Which one of us can or wants to consider a $15 per hour job as an income on which to raise a family? When did it became fashionable to tell hard-working low-wage workers that they should be content with having a minimum-wage job, or that they should consider a minimum-wage job a career designed to support a family? The debate is certainly not racially motivated, but the consequences of the direction we are taking will certainly disproportionally and negatively impact minorities more than anyone else. We are at the point of creating a generational underclass. Let’s recognize that some low-wage workers may themselves be part of the problem causing their lack of marketability for higher paying jobs because of their lack of education, training, skills, their job history, and other factors. But raising the minimum wage to a level that is not economically viable for businesses does nothing to fix those foundational problems. We can have reasoned discussions about regional differences in minimum wages, training, or student wages, but let’s first admit that these are merely ways to make a bad solution only slightly more politically palatable. A single magic bullet is not possible; FDR’s solutions from 80 years ago were not effective then, and they will not work now. The top 25 members of the Fortune 500, leaving Walmart out of that club, have a “profit per worker” of $124,588.00. These are companies primarily in the banking, telecommunications, oil and gas, and technology industries and do not generally need low-skilled minimum-wage workers. Now consider that, for the 14 franchisors included in the Fortune 500, their average profit per worker is $5,625.00. These are companies in the restaurant and hotel industry, and it is these types of industries that have the low-skilled entry-level jobs in the United States, and which can least afford an increase in their cost of labor. We need to stop the nonsense, in the discussion of low-wage workers, that all businesses are the same. Rather we should be focusing our efforts on finding ways to make it possible for low-wage workers to obtain the skills necessary for them to work for the companies that can afford to pay higher wages. In a few years, the restaurant, retail and hotel industries will not need as many as they do now, so time is not on our side to find a solution. There is no argument that a lack of sustainable annual income is having and will continue to have a negative impact on a significant portion of the families in our country. This is a serious issue for all of us. However, it serves little purpose to reach for short-term solutions that will negatively impact long-term objectives. The risk is much too high and the solution we need to reach must be sustainable while meeting the immediate needs of low-wage workers within the significantly constrained governmental and private sector resources. Social services will still be essential for low-wage workers to live. Government should be partnering with private enterprise, better skilled at operating efficiently, and look at ways to improve the cost of delivery of social services. Based on the testimony I have heard, we should at least be able to provide social services with the dignity the recipient is entitled to receive. We need to stop penalizing low-wage workers who receive social services and instead reward them when they begin earning more, instead of punishing them with the loss of the social services they will still need for a while. Taking away benefits is a disincentive to low-wage workers moving up the ladder. We need to become pro-business again and begin to remove any barrier that is holding down the creation of jobs and that penalizes job creators. We most certainly need to reject the fissured economic philosophy advanced by Dr. Weil, the DOL, and the NLRB. In a technology economy and a changing culture fueled by the millennial generation, independent contractor relationships in a gig economy will become the norm. There is nothing wrong with our advancing that to occur. We need to start doing things to actually help the low-wage worker. We need to invest in training to help them gain an entry-level job, then provide them with continuing assistance to help them advance into career jobs at higher rates of pay. The private sector in franchising is playing its part. Now it is the time for the public sector and the unions to do their fair share. We need to ensure a quality level of education and begin to measure the performance of schools and teachers, just as the private sector does in measuring the performance of its workers. Too frequently low-wage workers do not have the basic skills required for the current jobs available, and providing those basics is borne by the companies creating the jobs. What is needed, though, is giving students the training and capabilities they need in a technology world - not destining them to unskilled labor, as our current educational programs seem to do. We need to increase the opportunities for qualified tradespeople by improving their training and begin to deliver early job counseling in impacted communities. This was once the historic role played by labor unions until they began to focus their resources into political donations on propping up their failing membership numbers. Unions are a major part of the problem and need to be transformed. Unions are a class of protected providers unmatched elsewhere in our economy. In the private sector customers have choices of where they wish to shop, and even have the choice to determine if they want to have the products or services at all. Union members don't have that choice, and are forced to join and pay dues if they want to work for many companies or government agencies. Most existing union members have never been given the chance to ratify the union they have been forced to join, as ratifications took place 50 to 60 years ago by workers who long ago retired or have passed on. Union members should be given a choice to annually recertify their unions, and by doing so will restore balance in the labor industry and force unions to adapt to the needs of their members and become part of the solution. We need to examine whether public sector unions are beneficial, appropriate, and should continue. Looking at possibly reversing what New York’s Mayor Wagner started decades ago is something that needs to be considered. Much of our federal, state, and local budget deficits are crowding out our ability to fund improvements in the economy, and are caused by the added costs and work rules imposed by public sector unions. Adapting the government to use the gig economy, as the private sector is now doing, is a practical path to consider. We need to stop attacking the private sector for our economic problems and look for sustainable solutions that will help the low-wage worker transition in the technology age. These workers are the backbone of many of our communities and deserve our assistance. All an increase in the minimum wage will do is perpetuate their problems and ensure generational poverty. We can do better, and we must do so now by addressing the problem with priority.